seven − seven = Required Please enter the correct value. 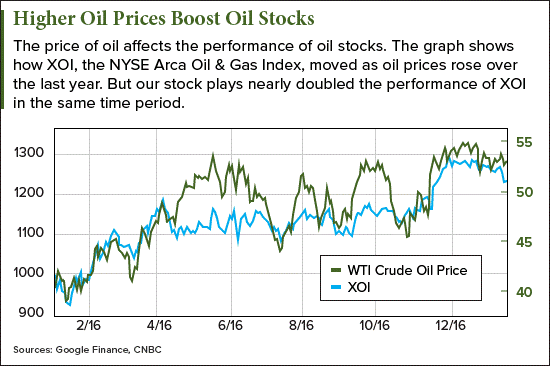 Today, we've found the best oil stocks to buy to help you profit from rising oil prices. You see, Money Morning Global Energy Strategist Dr. Kent Moors says oil prices could climb 20% higher in 2017. And the oil stocks we've picked today are uniquely positioned to profit from these rising oil prices. WTI crude oil prices have soared 14% to $52.97 a barrel since OPEC agreed cut oil production on Nov. 30. Because oil prices are rising, oil producers are making more money on their oil, so oil company stocks are positioned perfectly. And now is the perfect time to invest in oil stocks as oil prices are poised for that 20% gain I mentioned. To show you how higher oil prices help oil stocks, let's look at the NYSE Arca Oil & Gas Index (NYSE Arca: XOI). XOI tracks a sampling of major oil stocks. Check out how XOI moved with oil prices last year. As you can see, XOI has climbed alongside oil prices. The two oil stocks we're recommending today have doubled those gains. Now, trying to make money on rising oil prices by trading oil futures can be risky. Oil futures can swing dramatically based on every bit of news, from the value of the dollar to renewed EIA estimates. And oil ETFs are weighed down with bad stocks and management fees. Our crude oil stock picks surged a combined 36% over the last year. Analysts project their earnings per share (EPS) will grow up to 91% in 2017. These top oil stocks pay an average dividend yield of 5.7%, much more than Big Oil companies like Exxon Mobil Corp. (NYSE: XOM) and its 3.59% dividend yield. As long as the OPEC agreement stays in place, the cartel will be able to manage an oil price floor above $50 a barrel. And Moors thinks oil prices will rise above that, too. Oil prices hit a 10-year low in 2016, when the price of WTI crude oil fell to $35.59 a barrel in January. Oil prices had been above $90 a barrel as recently as 2014. But the collapse of oil prices was partly by design. Saudi Arabia took a risky gamble that it could drive American shale oil companies out of business by flooding the market with oil, sending the price of oil downward. The EIA estimates shale oil amounts to 52% of American oil production. But producing shale oil is expensive. That means it was only profitable for American oil producers when oil prices were over $60 a barrel in 2014. And that's why the Saudis hoped to tank oil prices. The Saudi gamble collapsed oil prices. But it didn't put an end to American shale oil businesses. Low oil prices simply meant American oil producers got more innovative. Shale oil is now profitable above $40 a barrel, according to data from Reuters. Now countries that rely on oil exports to fund their budgets, like those in OPEC, are desperate for higher oil prices. And they have little to show for the Saudi gambit to claim market share from U.S. producers. That's why OPEC was able to reach its first agreement to cut oil production since 2008. Moors says the cartel's need for higher oil prices is the reason the agreement will last, too. So far, OPEC has adhered to the agreement since it officially began on Jan. 1. Oil prices rose 2.4% yesterday (Jan. 31) on news OPEC members are still complying with the agreement. The cartel has cut oil production by 1 million barrels a day since the agreement started. Most importantly, Saudi Arabia has led the cuts by slashing its output to below 10.1 million barrels a day. "If Saudi Arabia is cutting even more than it promised, that shows its intent to make the deal work," says John Saucer, vice president of research and analysis at Mobius Risk Group, as reported in The Wall Street Journal yesterday (Jan. 31). As long as OPEC keeps oil prices above $50 a barrel, American oil companies will continue to grow. And the best oil stocks will soar. So now that you know oil prices are heading up in 2017, we're going to show you how to profit from it. I would like to know how this PTCO penny stock is doing? Are some of the big oil companies forcing its stocks to go down so it cannot compete in the bigger market? I keep reading how this stock is suppose to soar. What is keeping it down?